Barrett, our tile guy, brought out the mosaic floor tile last night. Sadly, the red is the wrong color. We picked up a sample in late summer when we were looking for matching colors and the tile he ordered around October is not the same color. 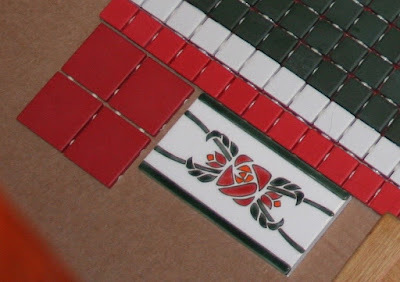 He called Dal Tile and apparently reds are not always the same. The new red looks too bright and candy cane and it doesn't look period to us. In theory we could special order a custom color but we really only need 6 square feet of it and who knows how many months it would take (and how expensive it would be). 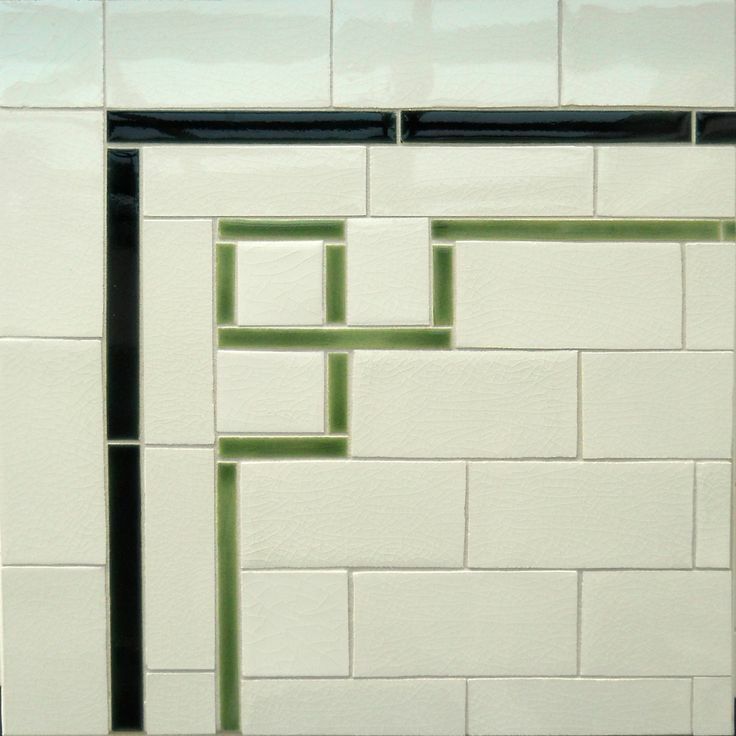 Barrett is still working on the problem, but we likely have to change the tiling plan. 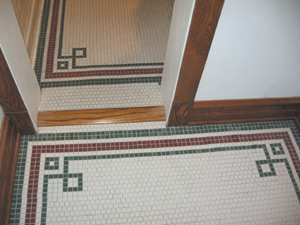 We are actually expecting to go back to the original plan, which is tiling based on this floor. Since our master bathroom will have stained woodwork trim like the rest of the bathrooms, we think the rust tile will look OK as it will blend with the woodwork rather than the deco tiles. This is probably a good place to share our wainscoting tiling plan as well. Before I bought the tile auction, I was planning the shower something like this. 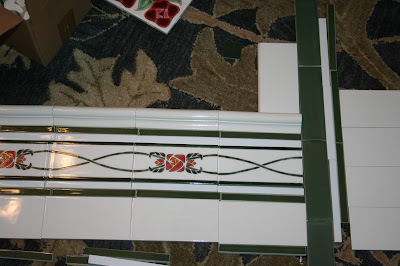 But then we found the decorative tile among the tiles we bought at the auction. Unfortunately, there are not enough of them to entirely encircle the bathroom so we had to adapt the plan a bit. 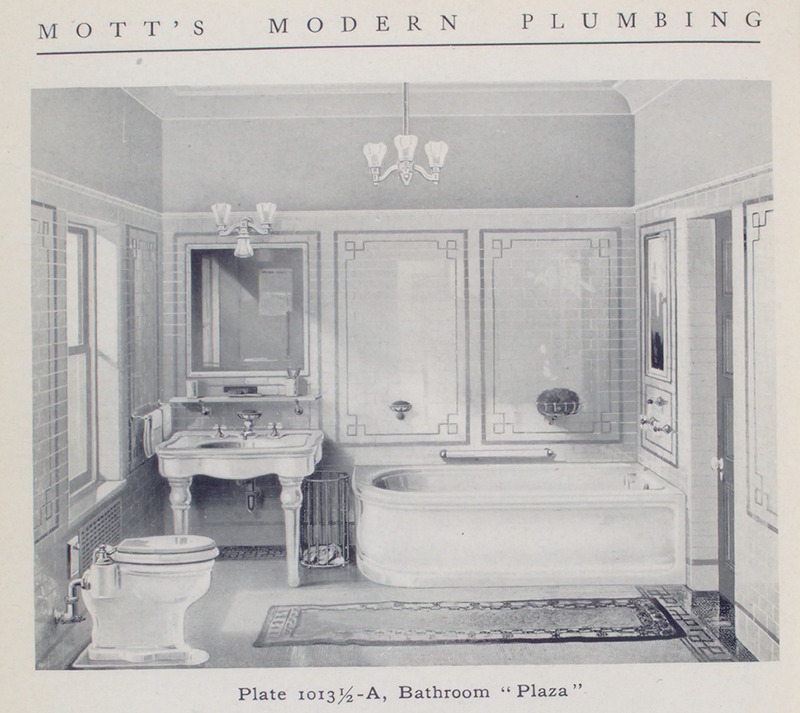 So, instead, we are going to run the deco tiles in the wainscoting outside of the shower and terminate them at the shower. It's not like you will see them inside the shower anyway because I will NOT be installing a clear glass enclosure. We plan on laying out the tile something like this. 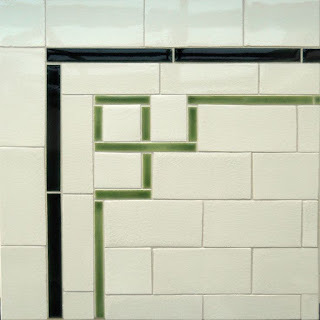 And then we think the interior of the shower will be tiled something like this. 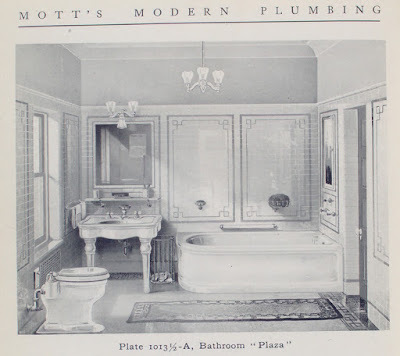 I was cruising around the newly released New York Public Library public domain images and I found this in a Mott's Iron Works 1911 bathroom catalog. Check out that tile pattern. Now I'm pretty enthused about the pattern we've chosen.